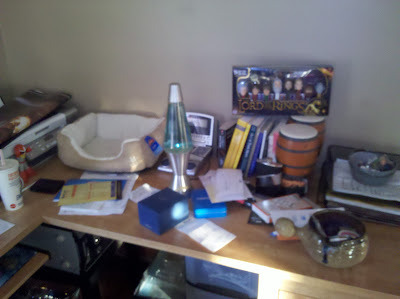 My desk is almost permanently messy. I considered cleaning it up before taking the pictures for this post, but I felt that would be disingenuous. I do periodically set out to clean the thing, but that is rare. I think I'm going to do so after I finish writing this post. My desk is in our 'guest bedroom'. It is called that because to the left of my desk there is a bed that nobody has ever slept on. I also have a comfy black office chair. In the corner (not pictured) are several board games. Also in the room, the cats' litter box, which often provides wonderful odors. Since my office (guest bedroom) is somewhat out of the way, I don't spend as much time in here as I might otherwise. This is gross, I need to fix this. The really sad thing is that it was much worse a couple days ago. 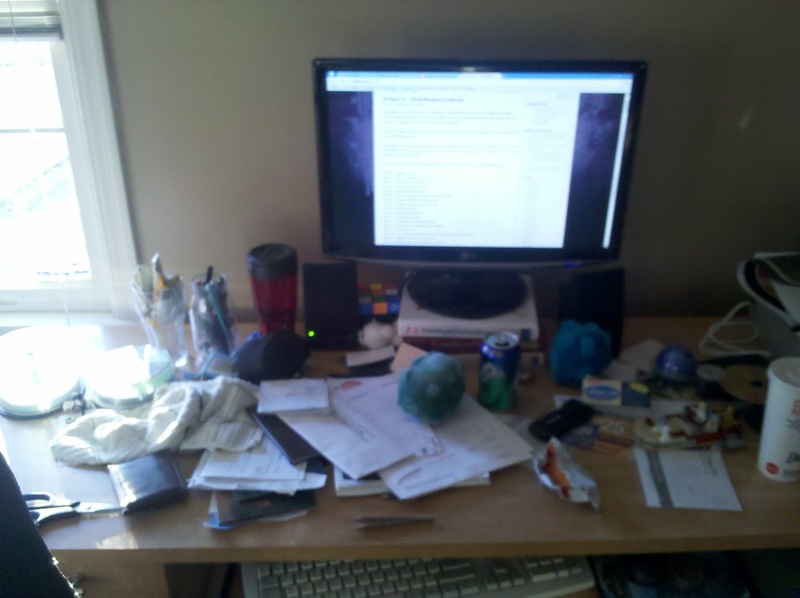 Note: I didn't actually end up cleaning this mess after I wrote this post. Shame. Don't read this, it's boring and stupid.